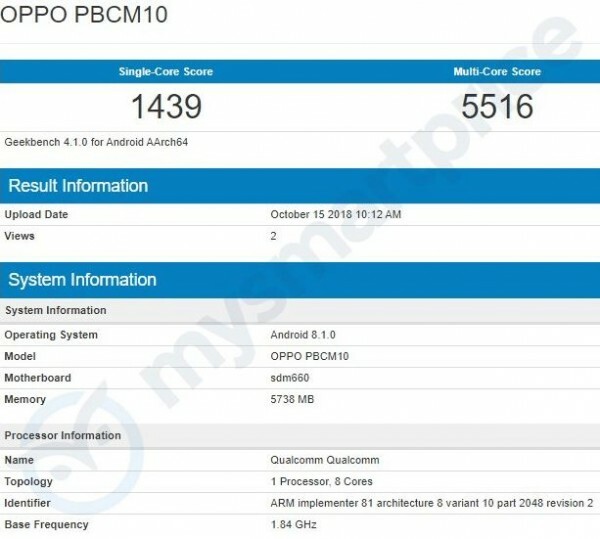 The Oppo PBCM10, which leaked alongside two other phones last week, and is believed to be called the Oppo R15X, has popped up on Geekbench. The device listed in the benchmark carries a Snapdragon 660 chipset (corroborating an earlier leak) with 6GB of RAM and runs Android 8.1. We expect the Oppo R15X to carry a 6.4-inch display with a water drop-styled notch, 4GB and 6GB of RAM, up to 128GB of storage, a 16MP+2MP main camera and a 25MP selfie camera. The battery is rumored to have 3,500mAh capacity.